With My Little Pony halfway through its seventh season, the kids who watched the first episode when they were five are now getting closer to 12 and 13. If this were the 80s, most of those kids would have moved on to a new interest by now. But times, and TV, are changing and more kids are keeping up with their cartoon love through their teenage years or adulthood. Just as the great J.K. Rawling made the Harry Potter series progressively more mature to keep up with her growing readers, the My Little Pony writers have introduced a friendship, with Trixie and Starlight Glimmer, more characteristic of friendships between teenagers. 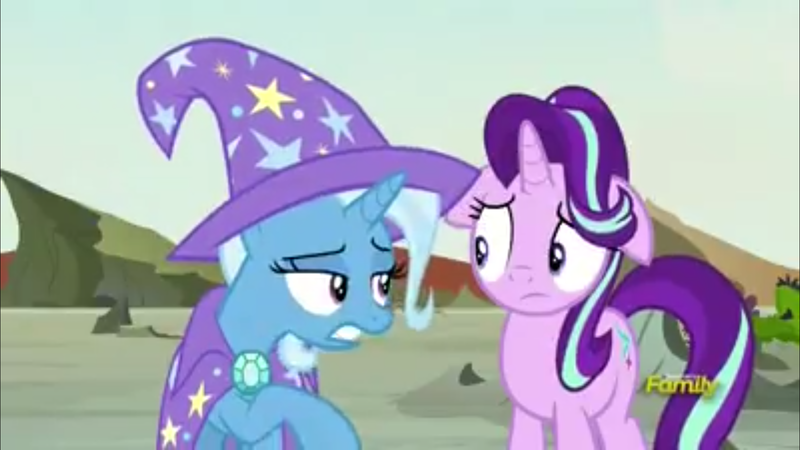 While the Mane 7 (hang in there, Spike) learned lessons centered around small hurts and making up afterwards, Trixie Lulamoon can show her rough ages without making it a big deal to Starlight, who seems to understand Trixie doesn’t mean anything by her obnoxious personality. Although they certainly had issues when Trixie went to far in “All Bottled Up”, this never resulted the sort of lesson Rainbow Dash learned in “28 Pranks Later”, or the divisive ” The Mysterious Mare Do Well,” where the ponies sought to correct aspects of Rainbow’s personality in order to avoid conflicts. Trixie and Starlight more resemble the sort of friends who can jokingly say “You’re getting so fat” and “Shut up!” with no one getting angry. Trixie might be a little rough around the edges, but that’s alright because Starlight can accept her for who she is. This sentiment was echoed in the episode “To Change a Changeling.” Starlight tried to make Pharynx just like all of the other Changelings. In the end **SPOILERS** Pharynx changed very little. The Changelings learned that he was still one of them and still cared enough about the hive to fight a monster by himself. This episode is also interesting because of the mistakes Starlight made, although her plan actually worked in an accidental sort of way. She’d intended to show the hive that Pharynx still loved them, or at least Thorax. She ended up showing the hive that they still loved Pharynx. And while Trixie may not have seemed particularly helpful when Pharynx called her out for saying he was a lost cause, it could be argued that her comedic two-facedness actually helped defuse the tension by giving the Changelings something to snigger about. Previous Is Luke Harper Making His Return?